Reconditioned pinball based on the classic cartoon series! 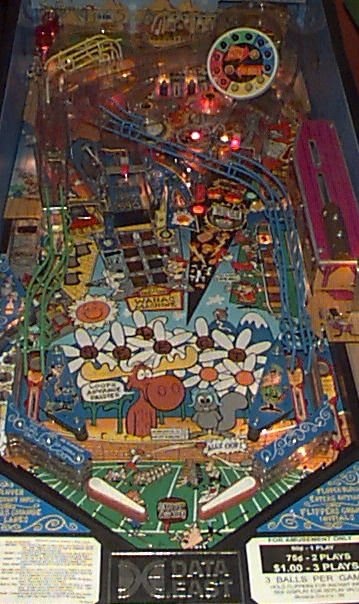 Straight out of Frostbite Falls and joined by their pals Dudley Do-Right, Mr Peabody and Sherman, Rocky the Squirrel and Bullwinkle the Moose bring their classic, popular brand of zaniness to the world of pinball tables! It was world renowned pinball manufacturer Data East who combined these crazy characters with the design and build you would expect from a commercial standard table. Rocky & Bullwinkle was originally released to the arcade, public house and amusement trade industry in 1993.